Oil giant BP has cancelled plans to build a new gas-fired combined heat and power (CHP) plant at Kinneil oil terminal in Grangemouth. Up to 400 temporary jobs were expected to be created if the company had gone ahead with the proposal. BP said it had reached an agreement in principle with Grangemouth refinery operators Ineos to provide the Kinneil site with power and steam. Ineos will continue to buy dry gas and liquefied petroleum gases from BP. A BP spokesman said: "In a challenging business environment, BP continues to review how our finite capital investment funds can be most effectively and efficiently be spent. "As part of this review, we have looked again at the requirement to invest in a new Combined Heat and Power (CHP) plant at Kinneil. "Discussions have taken place with Ineos, the operator of the Grangemouth refinery and petrochemicals plant, who currently buy our gas products and provide the Kinneil site with power and steam. "We have now reached an agreement in principle for Ineos to continue to purchase dry gas and liquefied petroleum gasses (LPGs) from us, and for them to provide Kinneil with power and steam. The Kinneil oil terminal, which is based next to the Grangemouth petrochemical complex, processes crude oil sent from North Sea platforms via the Forties Pipeline System (FPS). 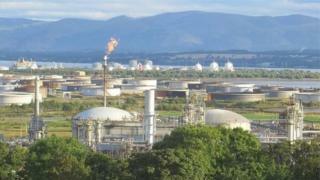 Plans for the new plant were given the green light by Scottish ministers in March last year. The BP spokesman said: "This renegotiated agreement will mean that the substantial investment required for a new Kinneil CHP plant will now not be required. "We believe this decision is in the best interests of the Forties Pipeline System business as we continue to address the ongoing challenges and cost pressures facing the industry."